For many school-aged children, a four-day weekend might mean sleeping late or hanging out with friends. But more than 70 local kids and teens chose to spend their Martin Luther King Jr. holiday comforting families during JourneyCare’s third annual Soup & Stories volunteer service project. 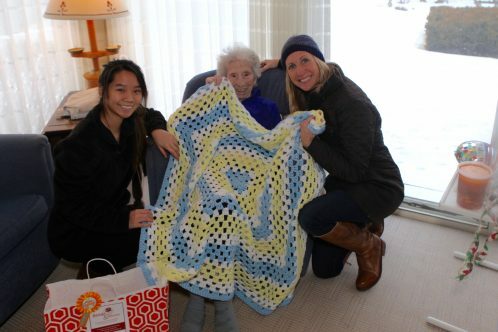 Members of the JourneyCare Juniors helped create 50 no-sew blankets. Delivery crews included JourneyCare Juniors, made up of students in fourth through eighth grade, high schoolers on the Youth Advisory Board, as well as parents, siblings and several adult volunteers. All of them braved bitterly cold weather to deliver containers of homemade soup, fleece blankets and decks of playing cards to 175 patients and families throughout 60 communities in JourneyCare’s 10 county service area. “What makes Soup & Stories unique, beyond providing an extra touch to help enrich the lives of those cared for by JourneyCare, is that it offers an opportunity for our youth volunteers to contribute to a project that truly impacts our mission while meeting the people who benefit from it,” shared Amy O’Donnell, JourneyCare Manager of Volunteer Services. Each care package contained a large container of minestrone soup from ZaZa’s Tavola Italiana in Lake Barrington, a fleece blanket and a JourneyCare deck of “story playing cards” with instructions on how to use the cards to help families share stories. The EMS Roaddocs Riding Club Wisconsin-Northern Illinois Chapter, a group of current and retired emergency services personnel, collected several hundred blankets, while some of the Juniors made about 50 more fleece blankets. Junior volunteers also helped with mailings, mapped routes for the deliveries and made phone calls to remind patients and families about the care packages. Soup & Stories volunteers were even able to help a patient named Elizabeth celebrate a landmark birthday for the second year in a row. This year, she turned 107! Volunteer Ashley Fanco delivers soup to 107-year-old patient Elizabeth on her birthday, as Elizabeth’s son helps. Some volunteers were able to establish instant connections to patients through shared interests. The care package deliveries were very much appreciated by the patients and family members.